For most new runners, controlling your breathing will be one of the first big obstacles to tackle. In this post, Coach Nate shares his favorite tips on breathing techniques for running. Breathing Techniques For Running: Why Is Breathing So Challenging At First? Just out of curiosity, what sort of position is your body in right now, as you read this? Slouched over, slumped back in the couch? Well, believe it or not, the way in which you breathe (whether you’re running or not) is affected by the positions you spend most of your day in. Slouching over can cause our breathing to get shallow. When it comes time to run, you’ve programmed yourself to take short shallow breaths, which often makes you feel panicky and like you can’t get enough air as you run. Breathing for runners comes down to regularly expanding the lungs (training at mid-high heart rate zones regularly) and thus, constantly improving the body’s ability to utilize oxygen. Let’s take a look at a few ways we can improve our breathing mechanics. 1) Lie down on your back. 2) Put one hand on your chest and one hand on your belly. 3) Take a few breaths, noticing under which hand most of your breaths are happening. 1) Take a big inhale through your nose. 2) Start by filling the chest, then the mid-chest, then the belly. 3) Now reverse the cycle on the exhale. 4) Exhale deep out of the belly, then the mid-chest, then the chest. 5) The exhale will be through the mouth, rather than the nose. 6) Repeat these deep long breaths (hands still on belly and chest) for 10 repetitions. Time to put that new breathing strategy into practice. 1) Before you go out for that next run, spend a few moments practicing breathing ONLY through your nose. 2) Close your mouth and take 8-10 breaths using just your nose. You’ll notice the belly (versus the shallow chest/shoulder) breathing kicks in right away. 1) For the first 5 minutes of your next run, you’ll breathe ONLY through your nose. 2) After 5 minutes, return to your normal breathing. 3) For the last 5 minutes of your run, again breathe ONLY through your nose. If you’re not used to breathing this way (especially during exercise), there’s a good chance that the nose breathing will make you feel panicky and like you can’t get enough air. 1) As you get more comfortable, increase to 7-10 mins at the beginning and 7-10 mins at the end. 2) Once that feels doable, try running the first 30-40 mins of your run using just your nose to breathe. 3) One last challenge would be speeding up the nose breathing. 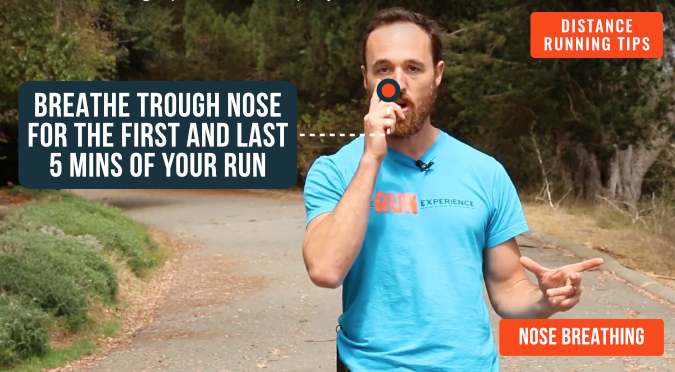 Try running 1 mile at a faster pace, breathing only through your nose. 1) Start running in place, at a moderate pace. 2) Now start counting how many steps it takes to inhale, and how many steps it takes you to exhale. 3) There’s no right # here, just make note for yourself. 4) Now consider this your home base. 5) From here, start playing with changing these #’s on command. 6) For example: if you were inhaling for 4 steps and exhaling for 4 steps, try inhaling for 4 steps and exhaling for 6. 7) Play with this for a few minutes in place. Consider this a new “gear shift system” for your running. Depending on the speed and intensity of your run, race, whatever, you should be able to match your breathing to your movement. Breathing for runners can make or break you. You’ll notice that at a quicker pace, the # of steps per inhale/exhale may go down, where as at a slower “long run pace”, it increases. There is no right number of steps per inhale/exhale. This drill is for you to figure out what you need at various speeds and intensities so that come the last 5 minutes of your 5K, Marathon, or whatever it is, you’re comfortable enough to pick a “mode” to finish and beat those last few runners in! There is ALWAYS room for improvement in breathing for runners. So whether you are preparing for a marathon, 5k or any other race, for best results, try incorporating at least one of these drills into your running training each week! Did you know??? We already have come up with the best running, strength and mobility workouts we could think of…all covered in our super-popular series of various running training programs. Check them out & don’t miss a chance of leveraging yourself! Looking for more distance running tips? Check out our blog on how to run downhill.